Do you celebrate Mardi Gras? Now I’m not one that usually does but I do like any occasion to celebrate with regional foods. When you think of Southern foods, most times it’s fried and covered with gravy and includes some kind of biscuits and butter. 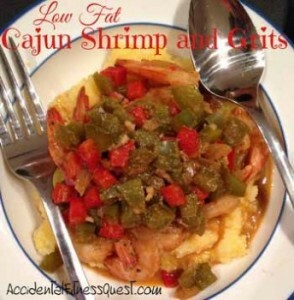 In honor of the event, I was thinking about down home Nawlins cookin’ and wanted to try to make a healthier version of a traditional southern dish. I love grits. I love shrimp. So I just made the leap that I’d love shrimp and grits. Gasp! Surprisingly enough, I was right. OK, it could also just be that I love food in general. Yeah, that’s more likely the case. But hey, a steamy bowl of shrimp and grits was pretty awesome. Add in the fact that it was healthy too and I was very happy. In a saucepan, bring the water to a boil and add the polenta and sugar. Lower heat and simmer for about 5 – 7 minutes until the water is absorbed. Remove from the burner and let it rest while you prepare the shrimp and sauce. Mix the spices in a bowl and toss with the shrimp to coat well. Set the shrimp mixture aside for a few minutes while you dice the peppers and onions. I diced mine into 1/4 inch pieces. Heat a pan over medium heat and spray with non-stick spray. Add the peppers, onion, and garlic and cook for 5 minutes until they are softened. Add the wine and Worcestershire sauce and stir slightly, scraping any browned bits off the bottom of the pan. Pour in the almond milk and broth and bring to a boil. Stir in the shrimp mixture and simmer for 15 – 20 minutes until the shrimp are cooked and the liquid has mostly evaporated. Divide the polenta evenly in bowls and top with the shrimp mixture. Salt and pepper, if desired. Makes 4 servings at approximately 295 calories each – 28g protein, 35g carbs, and 3g fats. To save a bit of effort, you can use pre-cooked shrimp and add them during the last 5 minutes of simmering the sauce to heat them up. They obviously take less time to simmer since they’re already cooked. Usually shrimp and grits call for dry white wine, but I didn’t have any. Being creative, I used leftover sake from my Korean Bulgogi recipe. Hey, waste not want not. I’m going to use it eventually in something. Just go with it I always say in the kitchen. If you don’t have wine or sake on hand, just leave it out entirely and you’ll be fine too. You can use regular milk or soy milk in place of the almond milk if you prefer. The 1/4 tsp of cayenne made it pleasantly spicy for me. The Kid said she started to break a sweat. Use more or less cayenne based on your taste. Shhhh, it really wasn’t that hot! Do you have a traditional dish where you live? Do you celebrate Mardi Gras?